Dates for this years Festival have been confirmed. 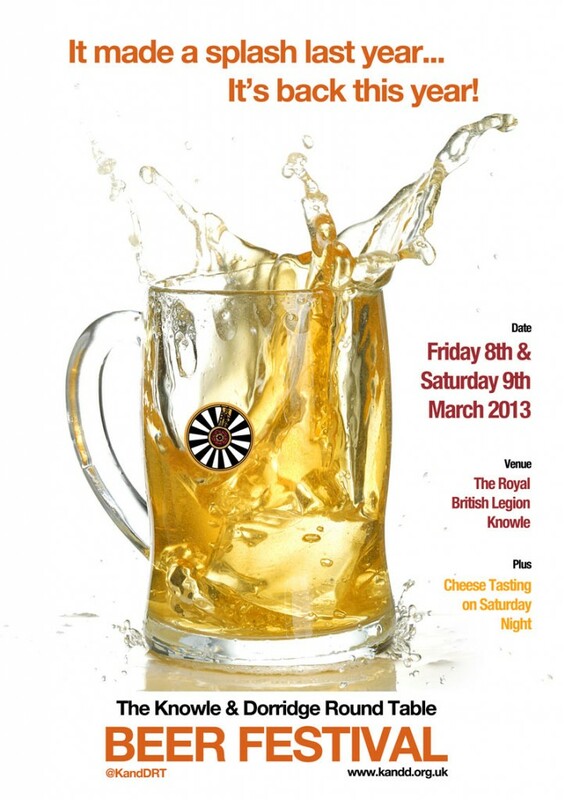 Friday 8th and Saturday 9th of March 2013! Thank you to The Royal British Legion in Knowle for allowing us to use their venue again. As well as a varied and exciting line up of ales and ciders (See Below), we are also holding a cheese tasting event on Saturday night. The Cheeses are supplied by Eric Lyons of Knowle and include Black Bomber, Red Devil, Amber Mist and Ginger Spice from the Snowdonia Cheese Company, a Stilton from Cropwell Bishop and a Brie from Somerset. Come along and help raise money while trying 23 carefully selected beers a cider and a perry. Entrance ticket £10 to include festival glass, beer guide and £5 of beer tokens. Extra £1 of beer tokens to Tablers, CAMRA members, British Legion members. Malt driven session bitter which is Golden in colour. A rich blend of two hops and two malts, ensures that this pale beer is stacked full of flavour. Stunning session beer, very pale, brewed using lager malt and very generously hopped with Centennial. An amber session ale brewed with American Simcoe and English Challenger Hops producing a fruity well balanced ale with depth and complexity good mouthfeel at first leading to a malt and orange finish. An ale connoisseurs choice. Traditional Black Country Mild, with hints of chocolate. A dry finish compliments the aroma of the Goldings Hops. Gorgeous straw coloured beer with a hop character that is pronounced but not all encompassing, dry but not overtly bitter and a tiny hint of sweetness to add body. A pale blonde ale brewed with New Zealand Nelson Sauvin and Green Bullet hops plus the addition of Pink Grapefruit and Kiwi Fruit gives a refreshing citrus blast. Winner of numerous awards in 2012 and sure to do well again in 2013. A full deep golden coloured beer with a soft hop flavour and balanced finish. A golden blonde ale- A real hop-feast of a beer! Two English and two Continental hops give a very satisfying bitter yet flowery palate. Maize, wheat and barley malts combine with the hops to yield a very soft, flavoursome & pale, thirst quenching ale. A balanced amber beer that has been bittered with Challenger hops. Cascade hops are added as a hop tea during the fermentation to give a distinctive but subtle spice and citrus aroma. A deliciously fruity golden ale brewed with a classic combination of Centenial and Cascade hops from the US. Deep ruby red bitter. Full bodied with a sweet caramel maltiness, and an intense hop finish. A light, refreshing, clear wheat beer, with a delicate hop finish. A light amber coloured, authentic IPA brewed with Cornish spring water and a blend of malts including Cornish grown Maris Otter barley. Proper Job is dedicated to the 32nd (Cornwall) Regiment who stoutly defended their garrison during the Indian Mutiny in 1857-58. Another brand new beer, stunning Golden colour brewed with Hallertau and Brewers Gold hops, malty with a big fruity hop taste with notes of citrus in the finish. A brand new limited edition beer with aromas of passion fruit, melon & kiwi. A robust bitter background with hints of fruit & malt, finishing long & dry on the palate. Golden colour. The brewery’s eponymous former Champion Beer of Britain. A dark, strong and bitter beer that defies classification. It has a complex malt taste with a hint of burnt flavour from the mixture of Crystal and Chocolate grist. A twist on our beloved Moonshine! Brewed with different coloured specification on malt but similar hop arrangement. Dark Gold in colour but you’ll still taste lemon and grapefruit on the palate. Brewed to celebrate the 40th anniversary of Pink Floyd’s seminal album. A rich, copper coloured beer which is sacked full of abundant malty flavours and a surprisingly dry finish. Brewed with raw cocoa, vanilla pods, flaked oats, wheat and a blend of beautifully dark malts. Successfully guess our mystery beer and the winner drawn at random on Saturday night will win a prize. The entry form is on the reverse of your beer tokens. A still Perry, made from locally grown Perry pears, fully matured in old oak vats. It develops an exquisite, delicate, light and fruity character, softly floral with a naturally pale colour. A crisp, still, dry, fruity, traditional cloudy, scrumpy cider. Bounds Brand boasts good all round qualities that make it an easy to drink cider, always leaving the taste buds tantalised. Knowle & Dorridge Round Table remembers those who've made the ultimate sacrifice in conflicts past and present.